‘Permissive hypercapnia’ is an inherent element of accepted protective lung ventilation. However, there are no clinical data evaluating the efficacy of hypercapnia per se, independent of ventilator strategy. In the absence of such data, it is necessary to determine whether the potential exists for an active role for hypercapnia, distinct from the demonstrated benefits of reduced lung stretch. In this review, we consider four key issues. First, we consider the evidence that protective lung ventilatory strategies improve survival and we explore current paradigms regarding the mechanisms underlying these effects. Second, we examine whether hypercapnic acidosis may have effects that are additive to the effects of protective ventilation. Third, we consider whether direct elevation of CO2, in the absence of protective ventilation, is beneficial or deleterious. Fourth, we address the current evidence regarding the buffering of hypercapnic acidosis in ARDS. 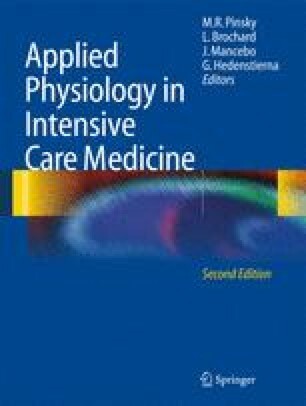 These perspectives reveal that the potential exists for hypercapnia to exert beneficial effects in the clinical context. Direct administration of CO2 is protective in multiple models of acute lung and systemic injury. Nevertheless, several specific concerns remain regarding the safety of hypercapnia. At present, protective ventilatory strategies that involve hypercapnia are clinically acceptable, provided the clinician is primarily targeting reduced tidal stretch. There are insufficient clinical data to suggest that hypercapnia per se should be independently induced, nor do outcome data exist to support the practice of buffering hypercapnic acidosis. Rapidly advancing basic scientific investigations should better delineate the advantages, disadvantages, and optimal use of hypercapnia in ARDS.